Today I am going to share a program that I wrote sometime back when I was learning to work with Selenium. I had a lot of people commenting and subscribing on my blog and I wanted to figure out if those emails were valid or not so I found out a bunch of websites that could do that for you but I did not want to go through the exercise of copy pasting and verifying one email at a time. So I wrote a selenium program to do that for me. The website did have a bulk purchase program but the minimum that one could purchase was 3000 emails and I needed to verify like a 100 hence automation to the rescue. I just tried this program recently and found out that it needed a fix. So I have fixed the program and its available on my GitHub page. This would give you a basic infrastructure and knowledge to write a selenium automation. This program is only educational purposes. I request you to not to use it for any other reason. The C# program can do whatever you want it to but it will take much more than just dragging and dropping the controls in visual studio. Visual studio does provide you with the code but that is just the start point for our application and we need to write C# code for our application to perform the task we want it to do. Let’s see what Visual Studio can do for us. 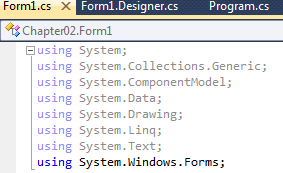 When we create a new Windows Forms Project in visual Studio, it adds an empty form to the project. What IDE does here is creates the files and folder for the project which are created from a predefined template that contains the basic code to create and display a form. When we drag and drop a button onto the form we see some of the C# code for the button property is automatically added by visual studio. What IDE does here is add the code to Form1.Designer.cs which adds the button to the form. When we double click the button then the code to handle the click of the button is added to this file. Visual Studio presents us with the property window in the IDE that we can use to set the various properties of the button. What IDE does here is update these values into the Form1.Designer.cs. Actually a C# program just starts out as a few lines of code in a couple of files and finally it runs on a computer. The following steps if how we do it. Program start out as source code – IDE is nothing more just a program that helps us creating, editing and managing our code files and resources. It bundles all these files into a solution by creating a .sln file and a folder that contain other files. The solution file has a list of project files (i.e. .csproj) in the project. The project file contains the files associated with the program. Build the program to create an assembly – When we build our application by using the Build Solution or Build Project option then the IDE runs the C# compiler which compiles our project into a exe or a dll depending on the project type we have selected (class library compiles into a dll and applications compile into exe). We can use this exe to run the program and when press F5 to debug our application then IDE runs this exe and provides additional options to debug the program i.e. pause or add breakpoint to a program. CLR runs the program inside itself – When we run the exe then CLR (Common Language Runtime) kicks in and acts as the layer between our program and Windows. Before C# in your program itself we had to deal with the complexity of communicating with the hardware and low level stuff but with .NET this taken care by CLR. CLR does the translation of our code to machine code so that computer understands it. Solution Explorer – It shows us everything that is present in our project. This shows us all the files, folder, references and resources in our project. Tabbed View – The IDE provides a tabbed view for accessing and editing the various files simultaneously. We can use Ctrl + Tab to switch between the opened tabs in Visual Studio. IDE helps write code – The Visual Studio IDE has a feature known as IntelliSence that helps developers writing the code. 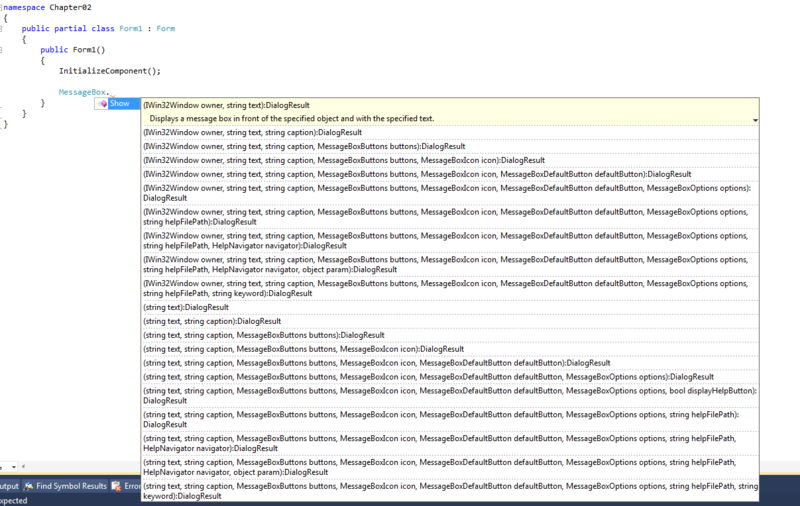 While we are typing code in the VS IDE we can see small Windows popping up. It shows us the various options we can select. It also provides the various inbuilt code snippets to auto type the code for us. For example if we want to add the code for a MessageBox we can type mbox and press tab twice and we will be able to see something like below. IDE helps in tracing errors – When we build our code using the IDE we see the list of compiler errors along with the details and the location of the error. Also when we debug our program the IDE firsts saves the changes in the project and then shows the compile time error if any. Whenever we are changing anything in the properties window or the design the application all these changes are also reflected in the code. 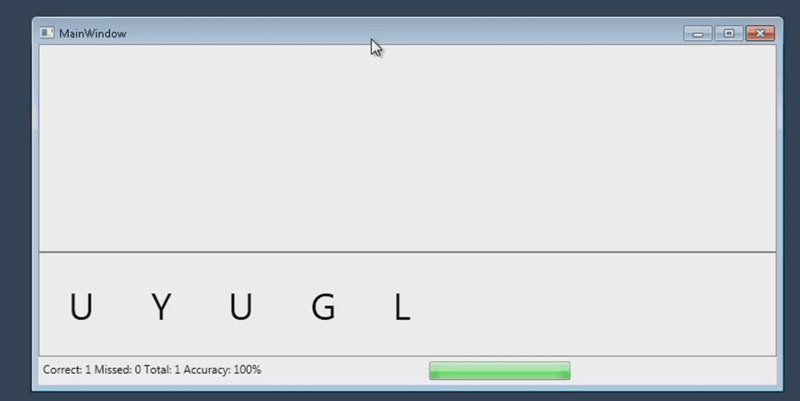 It might seem easier to drag drop controls onto our form but the IDE generates the code in the background. All the C# programs consist of namespaces, classes and methods which makes our life easier. Whenever we are writing a new class or a form the namespace need to be specified so that the code is separated from the .NET framework libraries. A Class is some code which consists of methods and properties to get the work done. The first part of our program is the one that specifies the .NET classes we need in our program. This is done by using statements as shown below. We can also refer other classes as well which are present in other namespaces. If we do not want to use the using statements we can use the FullyQualified namespace for any class to use it. The C# program is divided into classes. Generally most classes to one thing to keep them logically separated on the basis of what they do. So everything inside the first and last curly braces is part of Chapter02 namespace and the content between the second and second last curly braces is part of the class Form1. So to look for the content of a particular class or namespace we look for the matching curly braces. 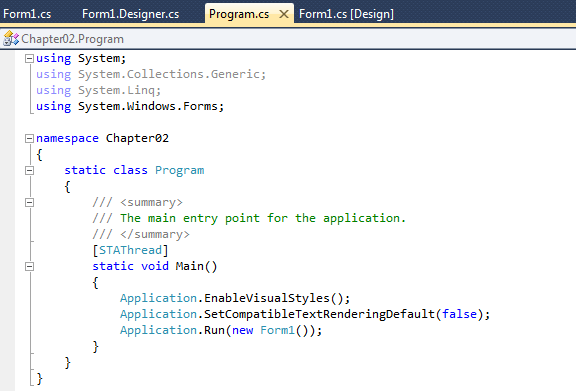 This class was created by the IDE when we asked it to create a Windows Form application for us. Classes contain methods that perform the actions as specified. A method takes some input and performs some action and might produce some output called as the return value. The class we saw makes call to a method called InitializeComponent(). A statement is a single line of code. 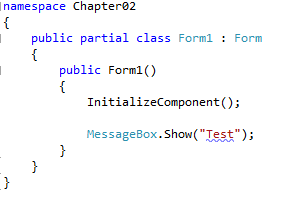 Like in the image above we can see we have added a statement as MessageBox.Show(“Test”); When programs calls a method then statements in that method are executed in sequence. Then method returns to where the method was called from when it either encounters a return or no more statements are available to execute. 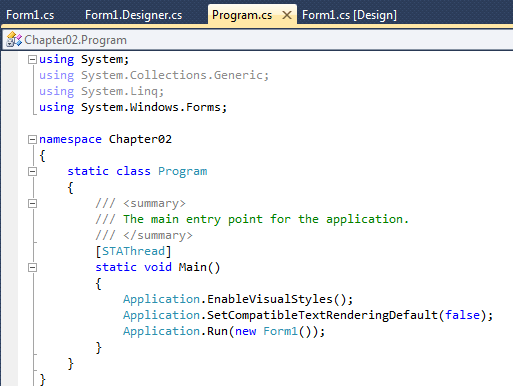 All programs in C# start at one and only Main method. When we created the Windows Forms application the IDE automatically added the Program.cs file which contains the Main method. 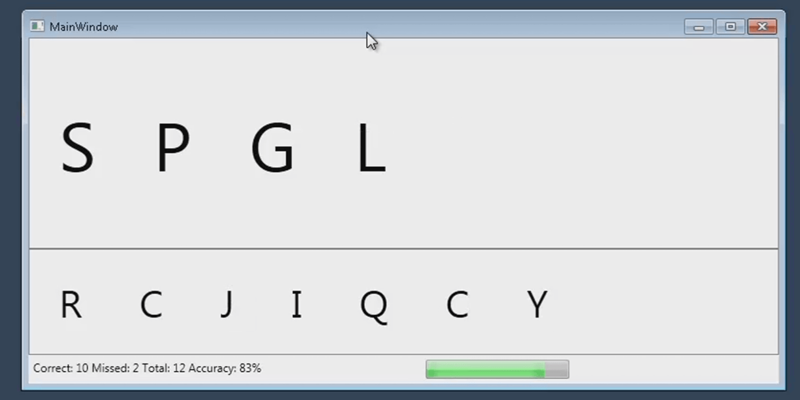 This is the entry point of this application and is the first method that will run. It’s not necessary that we keep this Main method as the entry point for our application. We write another Main method in a differ class and make it as the entry point for our application. We can have multiple classes in the same namespace. When a class is public all the other classes in the program can access it. A namespace can span multiple files. So can a class but we need to use the partial keyword for a class to split across multiple files. A variable is something in which our program stores all the data whether it is a document, image or a message. We can declare the variable as shown below. When we declare a variable we mention its type and name. When the program is compiled the compiler check if have assigned value of correct type to the variable. The values of the variable might vary at different times in the program. The assignment of values to the variable is done in the following way. += means adding the value to the variable and then assigning it to the same variable. -=, *= and /= have similar meanings as you might guess. ++ means incrementing the variable by 1 and – means decrementing the variable by 1. != means not equal to. We can use the debugger to see the values of the various variables at runtime by placing a watch on the variable on whose value we are interested in. So if you want see the value of variable sin a line of code while debugging the code we can do that by placing a breakpoint at that location by pressing F9 and remove it by pressing F9 again. For – As we can see in the example below the action inside the for loop will be performed till the evaluation of i<10. We need to be really careful while using loops because if the condition becomes false the loop might run indefinitely. While – As we can see in the example below the operation between the parenthesis will be performed over and over again till the evaluation of i>5 in true. If/else statements makes the decisions. As we can see in the example below the MessageBox will show the value if the variable yourValue is 3. The == sign that we see is for the evaluation and not assignment.